The Black Hole is an easy block for construction, as it has only one quilt patch to learn -- the flying geese patch. This quilt block is also part of the category uneven nine patch as it is constructed just the same as a nine patch, but all of the units are not the same size. 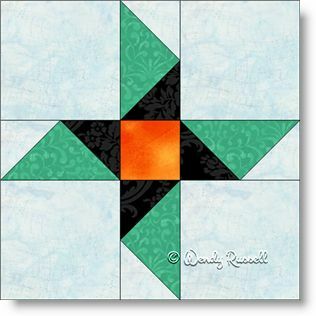 This time, I have shown four different quilt layouts in the samples illustrated, just so you know that a simple block does not mean that your quilt will be boring. Enjoy!